Specialized technologies that improve discharge planning and care coordination efforts are changing how patient health information is managed. With advanced interoperability and other special features, these systems have increased the capacity for information sharing and management among social workers, care providers, and patients. These factors are contributing to significant improvements in the quality of care patients receive as they transition from hospital to home and other care settings. As the use of these technologies grows, social workers have an important role to play in their development and implementation to ensure maximum usability and accessibility of the tools. The health care sector has steadily been implementing reforms aimed at reducing hospital readmissions, increasing operational efficiencies, and improving quality of patient care. One such reform is Medicare's Hospital Readmissions Reduction Program. This program aims to reduce the number of hospital readmissions occurring within 30 days of patient discharge. Hospitals face financial penalties if readmissions exceed the designated acceptable rate. With such initiatives under way, discharge planning has a critical role to play as hospitals aim to facilitate successful care transitions that reduce the likelihood of a 30-day readmission. Jeanine Tome, RN-BC, ACM, is vice president of care continuum for Saint Vincent Hospital, part of the Allegheny Health Network. She highlights the importance of information quality when a patient is transferred from hospital to a postacute care facility. Timeliness, legibility, and completeness of information, Tome says, have been widely recognized as key factors in information quality. With timely, legible, and complete health information, postacute care providers are able to manage patient needs more effectively, with a decreased risk of serious medical errors. By improving the quality of information shared and enhancing routine workflow processes, discharge planning tools have led to widespread improvements in the care transition process. Over the past decade, Tome has been involved with several large-scale initiatives to automate systems and implement discharge planning software systems in hospitals. She foresees this trend continuing due to the many benefits provided, one of which is time saved during the discharge process. In the past, Tome explains, discharge information would be communicated by phone or fax—an inefficient process that took time away from clients. Automating this process has allowed client information to be communicated much more quickly and efficiently, leaving social workers with more time to spend directly with clients. Discharge planning tools support improved decision making by social workers and other members of the discharge planning team. This factor contributes to a better quality of care coordination at the time of discharge, increasing the likelihood of better health outcomes for the patient postdischarge. Betty Thomas, LCSW, has extensive experience with case management in acute care settings and points to the role of effective needs assessment within the discharge planning process. Discharge planning tools, Thomas says, enable the discharge planning team to access a more complete patient medical history. These tools allow for more well-informed decision making regarding client needs and how to provide the most appropriate care possible. With this knowledge, service providers are in a better position to ensure that all the necessary resources are being put in place to support patient care and recovery postdischarge. Thomas also foresees the increased use of these tools going forward. Effectively supporting clients with complex care needs is one of the goals driving the trend to adopt different types of discharge planning and care coordination systems. Karen Zgoda, MSW, instructor with the School of Social Work at Bridgewater State University, notes that with certain diagnoses, the care can be involved and multifaceted. "Technology is allowing us to stay on top of the complexities of care in a way that we couldn't 10 years ago," Zgoda says. In order to respond effectively to clients with complex care needs, the appropriate technologies must be in place to support the collection of information over time and across multiple care settings. A key feature of discharge planning and care coordination systems is the ability to integrate data from multiple sources—something that becomes extremely important when you have clients accessing care from different providers. "When dealing with clients who have complex care needs, there may be multiple service providers involved," Tome says. "You need the ability to look at a patient across the care continuum and access information outside of your own immediate care setting." An exciting aspect of care coordination technologies is the increased capacity for patient engagement. Armed with the right tools and information, patients are better equipped to manage their own health. They can use Web portals and online tracking tools to report symptoms and health status changes. This makes it possible to identify potential issues and secure appropriate resources at an early stage, before more advanced interventions are required. "We can use a predictive model to assess health risks," Thomas says. "We can assess if an individual is at a higher risk for an emergency department visit, based on his or her health responses." The benefits of such early intervention are far reaching, both in terms of savings to the health care system and better patient health outcomes. However, for these benefits to be fully realized, the relevant tools and resources must be fully accessible to everyone. Care must be taken to ensure that vulnerable client populations are not excluded, cautions Ellen Belluomini, LCSW, faculty at Dominican University's Graduate School of Social Work. Belluomini's research work addresses the issue of technological literacy for vulnerable and marginalized populations. She cites digital literacy as a tool that can contribute to social equality—but this is contingent upon accessibility. Resources must be allocated to ensure accessibility for all population groups, both in terms of the availability of the actual tools/devices, as well as training on how to access and use the tools effectively. Belluomini cites several issues that must be addressed to ensure that technologies supporting care coordination and patient engagement do indeed serve as a bridge and not a barrier. These issues include lack of Internet access, lack of a phone, lack of an appropriate mobile device, cost concerns, lack of training for the individuals and their family members on how to use the tools, and language barrier issues. Social services generally have limited resources for integrating technology, Belluomini says, so workers need to stay aware of how various populations may be impacted. "We need to advocate for vulnerable and marginalized populations who may be missing out on the benefits of these technologies." Zgoda is also optimistic that as long as the tools and resources are accessible, technology can be used to level the playing field and support patient engagement for vulnerable populations. She points to smartphones as an example—this one device leads to a wide range of capabilities through the use of freely available apps. 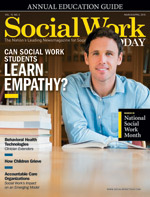 This is an area where social workers have an important role to play by providing training and support to their clients, by identifying the issues that vulnerable populations might face, and by making recommendations or influencing the design of tools that will increase accessibility for all population groups. As these technologies evolve and their use becomes more widespread, there will be an increased need for social workers who can speak both languages—social work and technology—as the two sides are increasingly integrated. Belluomini notes that technical specialists who don't necessarily understand the intricacies of the hospital health care environment typically build software systems; or, they may understand the hospital's basic workflow and processes, but not the more subtle cultural elements. In the absence of input from social workers, this can lead to systems that fail to live up to their potential in terms of enhancing communications and care coordination. Belluomini believes input from social workers to inform technical development is critical: "If you don't understand the system from both perspectives, how can you address the gaps?" Zgoda also sees value in increased collaboration between social workers and technical specialists, and views this as an opportunity for social workers to make a valuable contribution to the advancement of social work practice. "By taking an active role," Zgoda says, "we can make sure that the tools have the features and functionality we need, instead of having tools [created] without our input. Social workers have an opportunity to change the landscape and should be at the forefront of the development of tools for client care. The more opportunities we can provide to stimulate those conversations, the better the outcomes will be for social workers, technology providers, and clients."